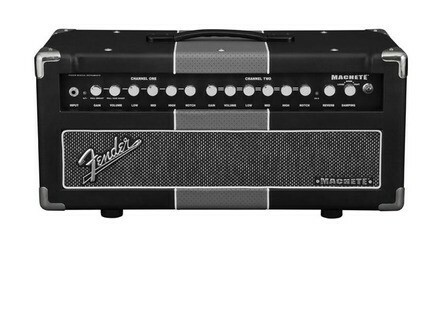 Machete 50 Head, Tube Guitar Amp Head from Fender in the Machete series. 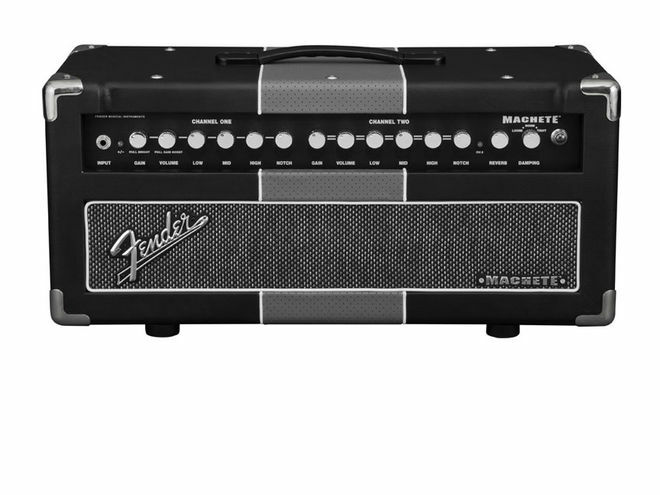 Fender expands its amp and cab offering with the introduction of the Machete 50 Head, Machete 112 Enclosure and Machete 412 Enclosure. Decked out in black vinyl covering with inlaid white piping and gray vinyl "steering wheel grip" accents, the Machete 50 Head is a 50-watt tube head. It features two channels (both gain, volume, low, mid, high, and notch); pull gain knob to adjust channel one’s preamp gain level; pull volume knob out to select the "channel one boost" channel for an extra boost of preamp gain; notch control that lets you adjust the channel one mid-frequency attenuation for a variety of American and British tonal flavors; built-in reverb that adjusts the reverb level for both channels; adjustable damping control for loose or tight speaker response; power amp mute switch for silent recording; XLR line output with cabinet emulation selector switch; and MIDI in for use with MIDI controllers. The Machete 112 and 412 Enclosures are closed-back cabs with a single 12" Celestion Vintage 30 speaker and birch-ply construction with black vinyl covering, inlaid white piping, Black Silver Strand grille cloth, chrome corners and pop-out casters. They add fullness when used as an extension cabinet with the Machete combo. Snark SN10 Pedal Tuner Snark introduces their first pedal tuner, the SN10.